are screaming underwater and drowning at the same time. mothers try to annihilate their children mentally and emotionally. They pit one child against the other. Others are cold and unexpressive. surviving and keeping themselves protected from the truth of her nature. When we are little we must do what we have to for survival purposes. with support. And then there are daughters that do it all on their own. is a severe personality disorder. You have prevailed. You are free. Fly and glide like the Monarch butterflies who complete their migration over three generations and thousands of miles–so beautiful so determined, so wonderful. This is going to be soooo good! I have to buy it and I know someone I have to gift it to! I loved your metaphor of screaming under water! THAT almost brought tears to my eyes because I really GET it. I know your story and I basically had a pretty great mom. But as she is getting older, the filter seems to be slipping and I have realized that a lot of my not so great traits have stemmed from parts of my mom that I never noticed before. Well, I did. But not so prevalently. The way she holds a grudge and is negative about certain people. And I noticed that our family always talked about one another. My sister has told me some things my mom has said about me and it hurts my feelings but then I think… well that’s not mom. But isn’t it? Ya know? 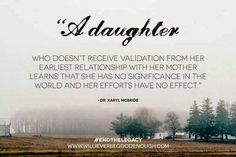 It has made me realize lately when my daughter has come to me about something she is upset with a friend over and I have literally had to redirect her. Her response is she was glad she came to me first. But did I cause her to jump to the negative in the way I raised her? It upset me to realize that perhaps. AND to be more aware to know that I have the power to break the cycle! NOW I see how you were conflicted, writing about your mom while she was still alive. As I write to you, I think that it would be a good blog post. But writing to you is enough. I know you understand. And that my friend is why you have to write this book. Just the screaming underwater made me connect so deeply with you that the title of this book … well, oh my! Don’t let it go for too long. Oh, cough, cough, me telling YOU my PUBLISHED AUTHOR friend to not stop writing when I have been stuck for this long! LOL. Hey speaking of which… I think that I AM going to take your advice and try to publish some of the poetry that my book inspired me to write. Do you have any guidance on poetry? Also, what about a place where I can go to find photos that I can actually use in my own book if I sell it for profit? Paid or free? Hey by the way, I really love this new look. I know you’ve had it for awhile in this new format but it is really calming here. I could write here all day. LOL Okay! I’ll stop highjacking your blog! Praying for your hubby – for a fast and complete healing! Thanks n Happy Easter to u too! I’m so terribly sorry. Unfortunately that is just as damaging. My ex bf’s wife is exactly the same. Spends 3 hours every day at gym after work seeking narc supply and ignoring their kids. It’s disgusting. I’m so thankful for my Mom. I miss her very much but I had the good fortune to always know I was beautiful, special and, most importantly, loved. Hugs to u! I know this only too well and sometimes we need to cut ties, even just for a little while. I can’t begin to imagine how incredibly difficult but necessary that must be. Is that what u did with ur Mom? Both narcissists?!?! That sounds like a friggin nightmare. Do u have siblings? Well, mother definitely is, but it’s unclear if dad is also a narc or just a violent bully. When he could no longer control, he distanced himself. We haven’t talked or seen each other in 20yrs. I was the scapegoat, which still puts strain on the relationship with my sister. Are you still in touch with your mother? Oh don’t be sorry. I was extremely lucky to have her for 33 years and my Dad’s still here so I’m good lol. 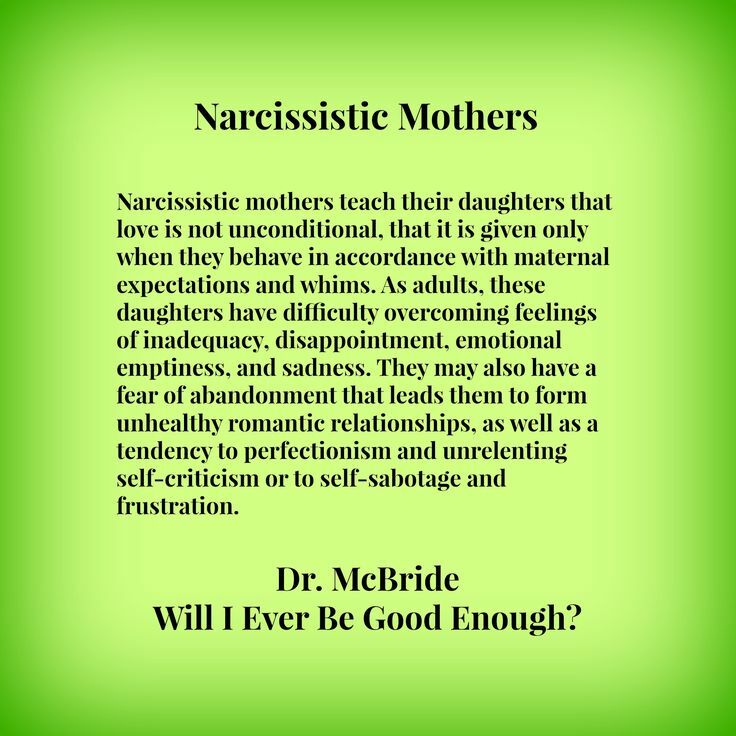 When you have a narcissistic mother you tend to have relationships with narcissistic men, because, well, that’s all you know…. Unfortunately that does happen quite often. 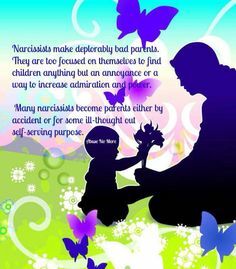 My ex’s father was the narcissist and he married an abusive narcissist.